Here is a familiar scenario that could be playing out at your place: It’s 6 o’clock, but you haven’t thought about dinner yet. You are getting hungry, your family is definitely hungry and you’re staring at an empty fridge. And, the pantry? Well, it is not in much better shape, either. Tummies are growling, moods are deflating, and, everyone is looking at you! You’ve probably heard that meal planning can save you time and money and make your week a lot more productive, too. Perhaps, as attractive as all that sounds, it still is not quite convincing you to take the time to strategize your meals for the week. I promise though, if you do, you will find even more advantages and dare I say, greater and more meaningful advantages than time and money! Come read on to find 3 other big effects meal planning can have on your relationships – yes, your relationships – in a very positive way and make that scenario above a foggy memory. 1. STRESS LEVELS GO WAY DOWN. In the scenario above, you could order out . . . again, but it may place a strain on the budget or not even taste that good or be very good for you. You could try to create something healthy AND delicious with what remains in the pantry, but that strains your creativity after a long day. Strain equals stress . . . and stress is contagious right down to all the ones sharing the meal – the very ones you look forward to seeing at the end of the day! If you make meal planning a regular habit at the front of the week, it frees up all that head space and energy the rest of the week. Dinner is an ongoing event and it is just not smart to stress over it every single night creating tension among the family. 2. ENERGY LEVELS GO WAY UP! That ordering out solution can solve the dinner problem but it sabotages you and your family’s health and your energy levels. True, ordering out or turning to junk food is quicker and can be more accessible than creating a balanced meal. But, bringing home take-out will rarely provide you with quality, whole foods. And those whole foods not only nourish your body but your energy levels and moods, too, to accomplish all you and your family want out of life. A well-nourished body and brain can better tackle those homework assignments, extracurricular activities and sporting events and turn up your creativity and mood levels too. Meal planning emphasizing healthy, easy and delicious meals is such a smarter choice to take care of your body, mind, and mood avoiding many health problems that could slow you down or worse. 3. DINNER HOUR CAN TURN INTO HAPPY HOUR! Dinnertime is so much more than just eating. It is a time to slow down a bit and gather as a family sharing your day – good parts and bad – .practicing conversational skills and table manners, learning about food, and bonding, too. Do involve other family members – spouses, significant others, children, too — on the meal planning and prep. This helps other family members develop valuable skills in cooking and family contribution and allows them to have input into dinner plans as well as provide an opportunity for more quality time together. 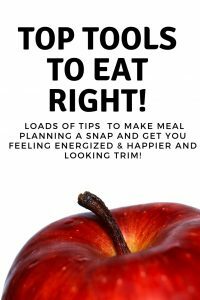 After you have practiced doing this for just a few weeks, it does become a quicker and easier process and you can certainly rotate some of your favorites meals as well. 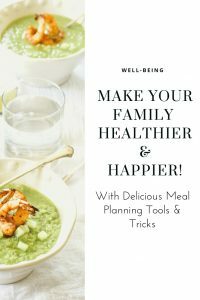 Once you do implement meal planning, there is no turning back and you’ll wonder what took you so long – and your family will, too! Love techy tools? These apps could be very helpful in meal planning for you. Your cooking space less than inspiring? I have lots of ideas for you on how to create a kitchen that inspires healthy eating. Don’t like to spend a lot of time in the kitchen? Make this one quick and healthy sauce that will make 5 different, delicious dinners. An Evernote user already? Here is what one of my favorite cooking sites said about how and why to use Evernote for meal planning. Here are some healthy drinks to boost your energy that you can make for your family to sip on throughout the week. Picky eater at your house? Here are loads of tips to try to turn that finicky eater around. I hope you and your readers find it helpful! Thanks for taking the time to comment. Thanks for sharing your tips with us at The Blogger’s Pit Stop!